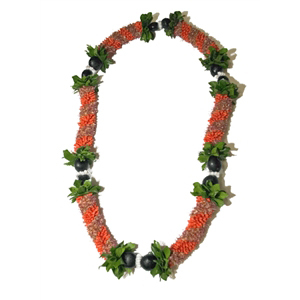 This long-lasting mishmash of kukui nut and cigar is a highly desired lei year round. The sizzling cigar lasts longer than most flowers while the kukui nut never perishes. Because kukui nut has a masculine appearance, the cigar with kukui nut lei is a popular choice among males. Note: Effective Immediately, (November 8, 2007), the green mock orange leaves seen in picture are agriculturally restricted from shipping outside of Hawaii. We are working with the US Department of Agriculture to find an approved leaf substitute. Until then, please call us for alternate choices for this lei or we will sew the lei with no leaves.